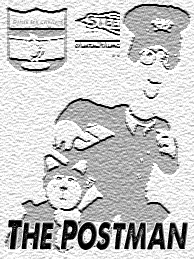 Every so often here on www.wdnicolson.com we will thaw out Fantasy Prognosticator 'The Postman' to deliver some NRL Dream Team and NRL Super Coach tips for your consideration. With two trades pretty much the norm for this week - here are 'The Postman's' 6 BEST TIPS for Round 5. 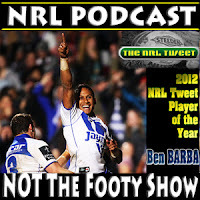 For our analysis of Tuesday team selections for Round 5 - click here. 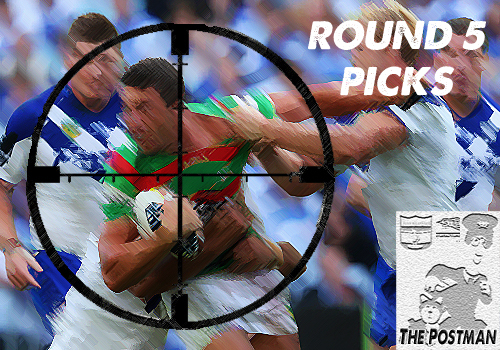 The Round 5 Tipping Preview is here with PLENTY of Latest of Late Mail. Voting Allocation for Round 5 of the NRL is here. The Postman Says: He is playing 65-80 minutes a week, getting it DONE and the plus this week is he has been named at lock against the Warriors. So what's not to like? As sideways trades go - he's worth it and he won't play rep footy. His biggest threat is his health - like 90% of your DT/SC options. The tackle break being relevant in both games also makes Baby John Burgess haaaandy. The Postman Says: Your local Postman missed the boat on him in DT but grabbed him in SC before his price went up... that DT mistake has been rectified. Look - he will taper off... but by how much? Tackle breaks are his best friend in DT and they make him just that little bit better in SC. His willingness to run the ball 2 times a set at times when he finally gets on the field means that his 35 minutes a game are like a 50 minute prop. Grab him and trade him in the future if you really need to... and you may not need to. The Postman Says: That foot injury didn't look good and that 66/79 BE looks even worse. The reason you move him now (or next week as his price won't change til he plays again) is because when he does play again - you'll lose money as it's just hard to see him being able to be firing straight away (foot injuries are not good news for playmakers/general play kickers). For his price you should be able to get a good swap - and if you choose to wait a week - keep a keen eye on some playmaking guns who have huge BEs this week and don't reach them. The Postman Says: Time to sell Klemmer if you can, his minutes are going to dissipate into nothingness very soon (if not tonight) and moving him for Jack Stockwell isn't a bad swap. He didn't quite get you the cash injection you might have hoped for - but take what you can this or next week before Stockwell goes up in price. The Postman Says: Having put my faith in Buhrer to secure 80 minutes of about 35 tackles and 15 hitups a week with Watmough busted, Williams gone and Glenn Stewart hurt - I'm jumping off despite a solid ppg average in the first 4 games. He made you a bit of money early, but Symonds is Toovey's flavour of the month right now and Stewart isn't that far off returning. That makes the potential for Buhrer to bleed cash just too worrying. Use his cash to upgrade if you can or store some mulah up for later. The Postman Says: If you don't get him into your team this week to free up some cash - odds are you'll be doing it next week given his great 2013 debut and his BE is going to be taaasty in Round 6. He's solid and Steve Price is a huge fan of solid - and appears to be ahead of Jack de Belin in the pecking order and probably Leeson Ah Mau and Michael Henderson as well. Biggest worry is missing out if Michael Weyman returns sooner than expected - but right now he's not a dumb trade. If you want a rundown on how your team has travelled through the opening month of the season - check out our Best of March Feature published earlier this week. What are your Fantasy tips for Round 5?